MILDURA’S next generation of passionate change advocates have made their voices heard in State Parliament and debated a Bill to victory which seeks to give young people in state care the option to do so until 21 years old. 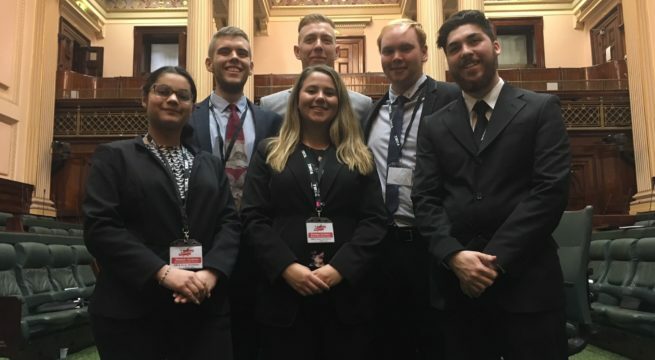 Six aspiring politicians aged 17-22 from the Mildura Youth Parliament were among 120 participants from across Victoria to visit Parliament House in Melbourne this week. Each regional group selected a Bill to debate and Hannah Jackson, Georgia Leutner, Jack Smith, Bryce Watson and Matt Golding argued for State Government backing for Home Stretch’s ‘out-of-home-care support reform Bill’.